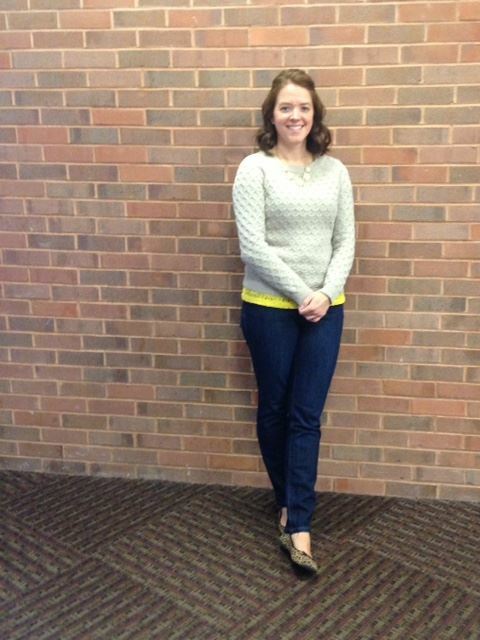 Sara Klink is currently the Assistant Director of Library Services at Stark State College where she works in a non-traditional academic library. She has worked as a librarian for 10 years in both public and academic libraries. Sara developed and implemented an innovative instruction program on her campus that incorporates in-person and online components to provide outstanding embedded library services. Six years ago when library services were officially brought to campus the library instruction program was non-existent. With the opening of the new digital library requests for your typical one-shot sessions grew rapidly, but with only one instruction librarian, it quickly became unmanageable. So she moved the rapidly growing instruction program beyond the typical one shot to embed library skills and learning objects into programs and courses across campus which not only expanded the library’s reach but connected the students on a more personal level with their digital library. A three stage library instruction plan was designed to create and embed learning objects that would take the burden off of the librarian and face to face instruction. Currently the library has embedded units in all composition classes and college orientation with development underway for developmental reading and the allied health programs. We are excited to announce that for 2015 we have not one, but TWO DLIG Visionaries! John Burke and Beth Tumbleson of Miami University Middletown were jointly nominated for their vast contributions to distance librarianship. They frequently co-present at national, state and regional conferences on topics that include marketing embedded librarian services, working within your institution’s LMS, and other hot topics in e-learning. 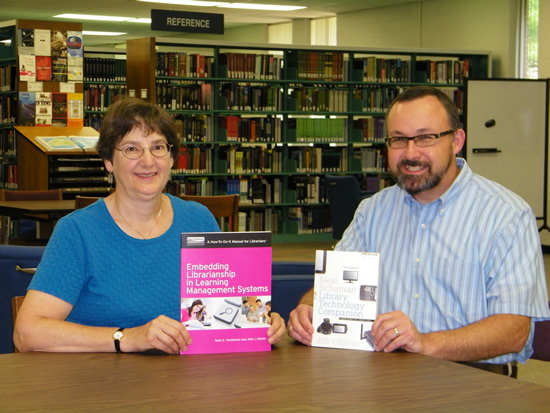 Additionally, John and Beth have co-authored several well-cited journal articles and, in 2013, they published Embedding Librarianship in Learning Management Systems: A How-To-Do-It Manual for Librarians (ISBN 1555708625). Whether you are just getting started in distance librarianship or you are looking for ways to streamline your services, you’ll find inspiration and guidance inside. We’re looking forward to their presentation at our DLIG Spring Workshop on Friday, May 15th at the Voice of America Learning Center in West Chester, Ohio (just north of Cincinnati). Please join us in not only congratulating John and Beth, but in thanking them for their service to distance librarianship! Kathleen Pickens, Coordinator of Information Services at Cincinnati State, has been named our 2014 Distance Learning Visionary. In her current position,she has worked diligently to ensure that off-campus students have equivalent access to library resources by promoting the library’s electronic resources, establishing guidelines for LibGuides development, and personally creating over 140 library guides in the last 18 months. Additionally, she is an internal Quality Matters Peer-Reviewer for her institution. Kathleen has been heavily involved in DLIG, and has been a driving force in many of its resources. She is also currently the Co-Chair of ACRL’s Distance Learning Section’s Communications Committee and is responsible for maintaining the DLS Facebook page with updates intended to spark collaboration and involvement at the national level. She frequently presents at local workshops and state and national conferences on matters related to distance librarianship, with topics including accessibility in the online environment, embedded librarianship, social media, faculty outreach, information literacy, and Quality Matters. Bridget Faricy-Beredo, Clinical Medical Librarian at the Mulford Library, University of Toledo, has been named our 2013 Distance Learning Visionary. Bridget's work helps enhance evidence-based practice through collection development, teaching and mediated searching. Bridget's continued support for distance learning has been demonstrated through her work with faculty outreach, providing tools that can be used to help faculty better support the research needs of distance students. Bridget highlighted her tireless efforts in providing faculty and student outreach at the 2013 DLIG/IIG Spring Workshop in an engaging session entitled Finding Your North Star. Kenneth Burhanna, Head of Instructional Services for Kent State University Libraries, has been named our 2012 Distance Learning Visionary. Kenneth's leadership and vision in supporting distance learning has been demonstrated through his commitment to developing strategic partnerships on campus, providing professional development opportunities, and by developing support tools and resources for librarians and instructors. A clearer vision for the strategic role their libraries can play in distance learning. Tools and approaches for providing leadership on distance learning initiatives. Models for creating guiding documents and online support tools. An awareness of key challenges for libraries in distance learning. "Distance learning is a strategic priority at many colleges and universities. It is a tremendous opportunity for libraries to contribute expertise and resources in supporting these initiatives. After all, it's really an opportunity to help meet institutional strategic goals while having those discussions about library instruction, services and resources that librarians always want to have. Distance learning could also be a threat. If libraries don't act with some sense of urgency to support online initiatives, we could be left behind."